1:33 a.m. — A report of a vicious dog in the 200 block of South Columbus Street was investigated. A police officer determined the did not appear aggressive and was staying near its home. 1:33 a.m. — A resident in the 400 block of South Riblet reported that a relative had used a bank card someone else’s bank card without permission. 9:49 a.m. — A resident reported that someone keeps opening credit cards by using his name. 1:05 p.m. — An employee at Donley Ford reported a tailgate had been stolen from a truck the previous evening. 3:35 p.m. — Police received a report of an erratic driver who was tying up traffic on Ohio 309 from Iberia to Railroad Street in Galion. Police were unable to find the vehicle. 6:41 p.m. — Police received a call about a groundhog that had been attacked by something near the disc golf course. When police arrived. Police disposed of the dead animal. 7:28 p.m. — Police received a report of kids swimming in the spillway at Amann Reservoir. When they arrived, the kids had already left the area. 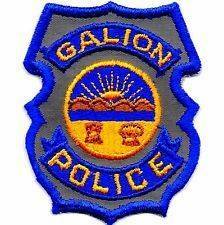 10:17 p.m. — Police received a report of a dog running lose at Topia Boutique on the square in Galion. They talked to the owners, who said they had left the dog in the story. 10:58 p.m. — Police responded to an apartment in the 100 block of Harding Way East after receiving a report of a man who was “really out of it” and covered with cocaine, who then took off in his vehicle. Police stopped the vehicle arrested the man for driving while intoxicated and took him to the Crawford County jail. 11:38 p.m. — Police responded to the 900 block of Walnut Street after receiving a report of a possible assault. The parties involved agreed to stay away from one another the rest of the night. 1:32 a.m. — A resident in the 600 block of South Market Street reported possible drug activity in the neighborhood. 2:07 a.m. — A resident reported that someone had been knocking in a window at the residents. 3:43 a.m. — Police responded to a domestic dispute in the 100 block of South Riblet Street. When they arrived they saw no signs of abuse, and the two people involved in the reported altercation would not cooperate. 1:29 p.m. — Police assisted the Crawford County Humane Society with the removal of four dogs and 11 cats from a residents. The dogs were removed, as were three cats. 1:34 p.m. — A wallet was found in the wallet and turned it in to police. 2:04 p.m. — A police officer was unable to catch a small dog running loose in the area of North Columbus and Church streets. 3:36 p.m. — Police responded to a call from an employee at Heise Park pool about two kids who were causing trouble. The children were kicked out of the pool for the remainder of the day. 3:37 p.m. — Police received a report of a child acting up by laying in the street, knocking on doors and chasing vehicles. Police talked with the child and released him to a parent. 5:26 p.m. — Police responded to a possible domestic dispute in the 200 block of Orange Street. The person who filed the report was asked to call police again if the situation escalated. 7:12 p.m. — A resident in the 300 block of Cherry Street reported receiving threatening phone from an acquaintance. 7:36 p.m. — Police received a report about possible drug activity on Hyatt Court. 9:07 p.m. — Police issued a warning to a woman after receiving a report that a toddler was riding in the front seat of a vehicle. 2:16 a.m. — Police received a report from the 700 block of Harding Way East about a possible robbery and assault. A man said he was robbed of $30 by a man with a grey hoodie and long goatee. He said the man hit him over the head and then took the money. The man who called would not give his name and when police called him back to see if he could come in and file a report, he did not answer his cell phone. 10:28 a.m. — Police responded to a report of a reckless driver and near Buehler Street. A man was given a verbal warning for driving with an invalid registration. 12:53 p.m. — A resident in the 300 block of South Union Street reported that a hit-and-run driver had damaged a vehicle. 6:58 p.m. — A man reported someone stole the bumper off his truck while the vehicle was in the 6700 block of East Brandt Road. 7:58 p.m. — A caller in the 100 block of South Jefferson reported that a relative had picked up a young child and was texting saying the child would not be returned. Information was taken by an officer to make a report. 9:18 p.m. — The driver of a semi was cited for failure to control after the truck he was driving “wiped out” a stop sign in the area of Charles Street and Donley Ford. A vehicle at the Ford dealership may also have been damaged. 10:24 p.m. — A report was taken about a broken gas pump at Circle K, 105 East Street. A woman reported being sprayed by a faulty hose. 7:26 a.m. — A resident in the 200 block of Gaius St. reported her vehicle broken into and a purse stolen. 9:00 a.m. — A resident in the 100 block of Schell Ave. reported her vehicle broken into and a GPS stolen. 1:23 p.m. — Officers assisted employees of Family Dollar in removing an opossum from the property. 2:02 p.m. — Officers assisted a disabled motorist in the 600 block of E. Warren St.
2:05 p.m. — Officers investigated a report of a family disturbance in the 300 block of E. Mansfield St.
3:43 p.m. — A resident in the 300 block of Clinton Street reported money stolen from a safe in his home. 3:49 p.m. — A resident in the 600 block of Hopley Avenue reported a stereo stolen from his residence by his brother in law. 6:51 p.m. — A disturbance between juveniles in the 600 block of E. Oakwood Avenue was investigated. 7:19 p.m. — A disturbance at Wendy’s was investigated. 11:27 p.m. — A report of rowdy juveniles inside Walmart was investigated. 1:03 a.m. — A resident in the 800 block of S. Sandusky Ave. reported her vehicle entered and property stolen. 2:35 a.m. — Officers disbanded a group of people arguing in City Lot #3. 2:58 a.m. — A report of an altercation between a male and female at Circle K was investigated. 8:25 a.m. — A resident in the 500 block of S. Walnut reported his green and black 15 speed bike stolen. 9:52 a.m. — Officers checked a fisherman’s welfare at Outhwaite Reservoir. 10:36 a.m. — Officers responded to a domestic dispute in the 300 block of E. Mansfield St., and both parties had left the area. 2:15 p.m. — A Bucyrus resident came to the Police Department to report an assault. 5:10 p.m. — A motorist came to the Police Department to report damage to his vehicle..
7:32 p.m. — A resident in the 600 block of Prospect Street requested officers due to her unruly child. 8:13 p.m. — A traffic citation was issued to a subject on a mini bike on the roadway in the area of Emerson and Maple Street. The driver was also suspended and the mini bike was towed from the area. 9:57 p.m. — A resident in the 1300 block of Whetstone Street reported her electric turned off at the residence and assistance was rendered. 10:35 p.m. — A domestic disturbance in the 700 block of Sunset Drive was investigated. 1:20 a.m. — A seventeen year old Bucyrus boy was arrested on a Juvenile Court pickup order for a probation violation. He was transported to Crawford County Justice Center to await transport to a juvenile facility. 1:26 a.m. — A suspicious person in the 100 block of W. Rensselaer Street was a despondent individual and a welfare check was made. 1:32 a.m. — A theft report was received in the 100 block of W. Mansfield Street. 1:51 a.m. — A report of an intoxicated male at Hymiler was investigated. He was transported home and released to a sober adult. 5:05 a.m. — Officers investigated a report of loud music in the 300 block of W. Warren St. Officer was able to wake up the resident and issue him a citation for loud music. 6:44 a.m. — Officers investigated a parking complaint in the 500 block of Rogers St.
10:00 a.m. — A parking complaint was investigated in the Grace and Warren Street area. 10:33 a.m. — Officers investigated a report of a disturbance in the 600 block of E. Rensselaer St.
12:44 p.m. — Officers investigated a report of a woman trespassing on Walmart property. She was gone prior to officers’ arrival. 4:23 p.m. — An open line 9-1-1 call was investigated and found to be children playing with a phone. A parent was made aware of the situation and advised she would speak with them. 5:22 p.m. — An employee at Walmart wanted to report being threatened. 7:18 p.m. — A report of a possible intoxicated male in the 500 block of S. Sandusky Avenue was unfounded, the subject was not intoxicated. 7:25 p.m. — A disturbance in the 300 block of Woodlawn Avenue was investigated. 7:57 p.m. — A noise complaint of a vehicle revving its engine in the 800 block of W. Mary Street was investigated. 8:15 p.m. — A Bucyrus resident reported a cell phone stolen from the Aumiller Pool locker room this afternoon. 8:35 p.m. — A verbal warning for loud music and trespassing on the basketball court at the Bucyrus Elementary School was issued. 8:56 p.m. — A loud music complaint was investigated in the 500 block of W. Rensselaer Street. 9:28 p.m. — A report of fireworks being shot off at Heritage Circle was investigated. 10:32 p.m. — A verbal warning for loud music was issued in the 400 block of N. Walnut Street. 11:31 p.m. — A noise disturbance in the area of McKinley and Woodlawn Avenue was resolved with the subject stopping his work for the night. 12:10 a.m. — A disturbance in the area of Plymouth and Sherman Street was a minor verbal dispute.